A small number of buyers is taking most of the insolvent companies on the cheap, likely diminishing productivity and eroding market competition. India’s efforts to clear its logjam of bad loans are taking the country into uncharted waters. 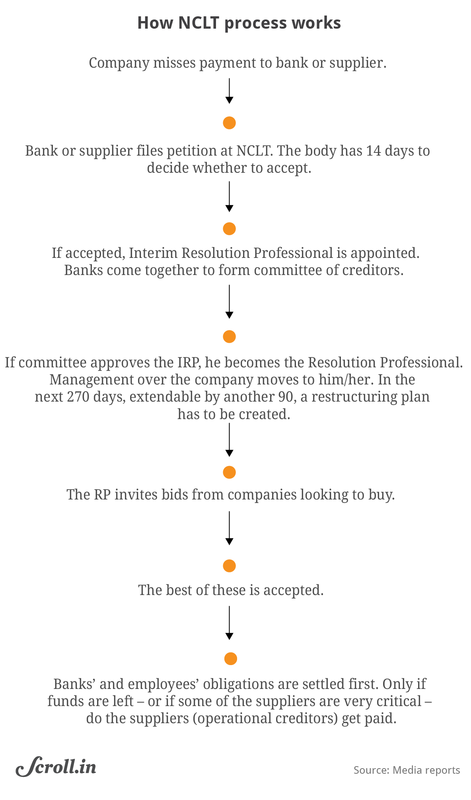 Most of the debt-burdened companies pushed into insolvency proceedings are changing hands very cheaply. And they are being acquired mostly by a small number of buyers. As a result, the country is seeing not only a major change in the ownership patterns of corporate assets in core sectors such as steel and power, but also a fundamental readjustment in how these markets will function. “With companies changing hands at low rates, we will see little productive activity but a lot of financial speculation as the new owners might prefer to recover their investments by trading these firms,” warned a former Union finance secretary who asked not to be identified. These dynamics were set in motion in June 2016, when the National Company Law Tribunal started working to recover loans from defaulting companies by selling them or by closing them and selling off their parts. Alongside, companies with excessive loans have been making their own attempts to reduce debt by selling off some of their units. On March 31, the bad loans granted by Indian banks stood at Rs 10.25 lakh crore. Of the 9,073 cases under the tribunal’s consideration as of January 31, Minister of State for Corporate Affairs PP Chaudhary told the Rajya Sabha in March, 2,511 cases involved companies facing bankruptcy. This, the official said, could create a cartel in the steel sector as companies collude to fix prices. India’s bad-debt crisis has its origins in the rise of a new generation of infrastructure companies in the early 2000s. Coming of age in the heady post-liberalisation days, these companies rushed to build empires that spanned thermal and hydel power projects, highways, ports, mines. Most of this growth was powered not by public listings the way Dhirubhai Ambani had built his empire in the 1970s and 1980s, but by borrowings from banks. By 2009, it was falling apart. A part of the tale was about irrational exuberance. 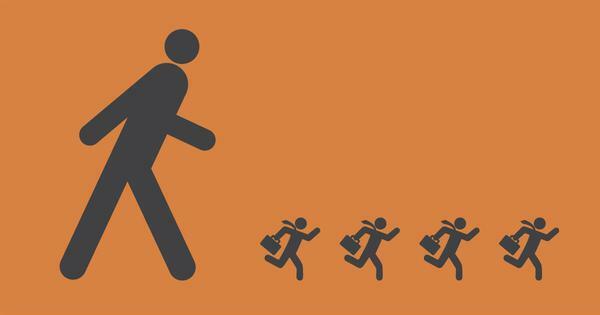 Chasing growth, these companies sought funding from banks even for unviable investments – and got it. Another part was about promoters siphoning off a part of their loans. Some were pushed into crisis by the end of the China boom, as the Asian giant scaled back its infrastructure drive after the Beijing Olympics of 2008. Others defaulted when policies changed such as when the Supreme Court in 2014 cancelled captive coal block allocations, undermining the financial assumptions on which several power projects rested. In addition, many companies were hurt when the abrupt implementation of demonetisation in 2016 stunted economic activity. In 2012, a report from Credit Suisse warned of unsustainably high levels of indebtedness among 10 of India’s largest infrastructure companies, which accounted for 13% of all loans made by banks. A subsequent report from the financial services firm in 2017 estimated that 40% of all corporate loans – mostly in metals, power and telecom sectors – had been made to companies that were not even earning enough to pay the interest on these loans. As India’s banks and policymakers realised that these loans might never be repaid, the Bharatiya Janata Party-led government tightened the noose on defaulters. So did the Reserve Bank of India, first under governor Raghuram Rajan and then under Urijit Patel. In 2015, the Reserve Bank of India created more stringent norms for recognising bad loans, triggering a spike in the banking sector’s estimates of loans that might never come back. In June 2017, the Reserve Bank released a list of defaulters, instructing banks to start a process of debt resolution. Twelve companies accounted for 25% of all the bad loans (Rs 2.5 lakh crore). Two months later, the central bank released the second list of 28 companies whose loans added up to Rs 1.5 lakh crore. The previous year, the passing of the Insolvency and Bankruptcy Code had laid out a new procedure for recovering bad loans. In February this year, the Reserve Bank told banks to start debt resolution if a borrower delayed payment by even one day. Defaulting companies began to be pushed into insolvency courts. But a few important questions about how these proceedings are reshaping India’s corporate sector have not received the attention they deserve. First, most of the companies pushed into insolvency proceedings are being bought rather cheap. Of the Reserve Bank’s first list of 12 defaulters, seven have already changed hands. 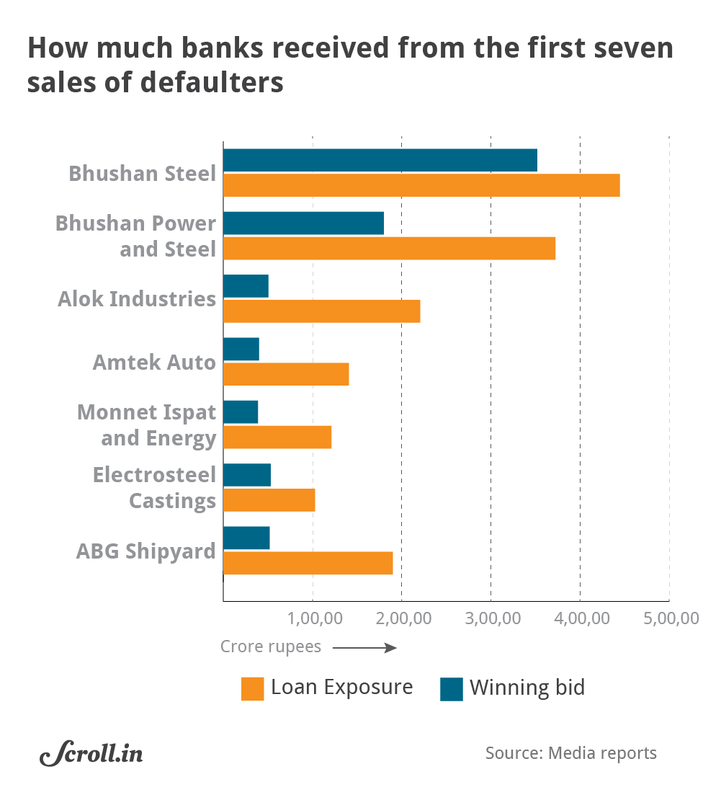 But only in the case of Bhushan Steel did banks recover more than half of the money the company owed them – the buyer Tata Steel paid 79% of the outstanding loans. In case of five others, the buyers paid less than a third of the outstanding loans. The seventh company went for 48% of the outstanding loans. These rates are so low, they are making building new companies uncompetitive. In the thermal power sector, for example, buyers of insolvent projects are paying no more than Rs 2.5 crore to Rs 3 crore per megawatt whereas a new thermal power plant costs around Rs 5 crore per megawatt to set up. A new 600 megawatt project would start making profits only after it has recovered the Rs 3,000 crore cost of constructing. But bankrupt 600 megawatt plants are currently going at Rs 1,500 crore to Rs 1,800 crore. Their owners, having paid only half the cost of a new project, can sell power cheaper. As such, new projects cannot compete with resold plants. These skewed dynamics, said the chief finance officer of a power plant who asked to remain unidentified, will dry up fresh investments in the sector. “We will only see acquisitions,” he predicted. A similar logic is playing out in steel. Bankrupt companies such as Monnet Ispat and Electrosteel Castings have changed ownership at a fraction of the price at which they were set up. Other steel companies will struggle to compete against them. Oddly, despite such large discounts – and even though buyers were allowed to submit late bids after seeing their rivals’ bids – few companies are participating in the auctions. Lanco Infratech eventually got one bid, from Thriveni Earthmovers. As it turned out, the bankers rejected the bid and opted for liquidation instead. Liberty House’ bid for ABG Shipyard was not finalised because it was the only one. Of the 11 initial suitors for Jaiprakash Power, only two submitted bids – Resurgent Power (floated by Tata Steel and ICICI) and Brookefield, an asset management company. This is curious. 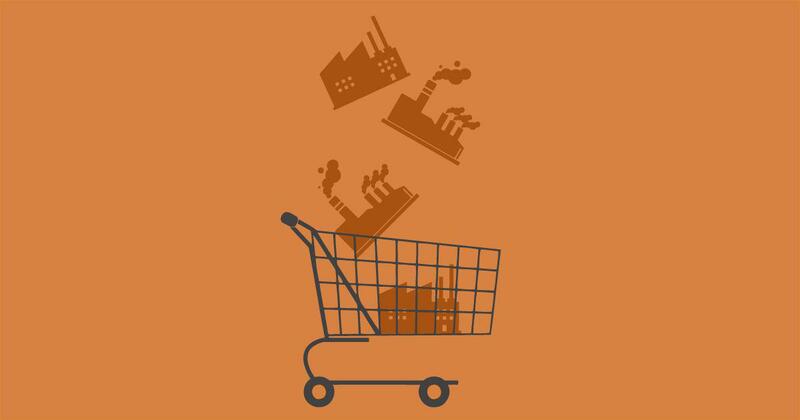 After all, the Reserve Bank’s first and second lists feature some of India’s best industrial units. “Given the discounts at which these assets are available, one would think the number of companies coming in would be far higher,” said MS Sriram, a professor at the Indian Institute of Management, Bangalore. One answer why there are few buyers for these companies is that they are entering the insolvency process at a time when India Inc’s capacity to buy them is quite low. Banks, haunted by bad loans, are lending only to a few. Apart from a few business houses looking for strategic expansion, said a person familiar with the National Company Law Tribunal’s proceedings, most companies are sticking to their core strengths. As a result, a motley group of buyers – hailing from diverse backgrounds but having access to cash – are stepping in and buying companies cheap. The consequences will be profound. This is the first part in a four-part series on India’s attempts to tackle its bad loan crisis.